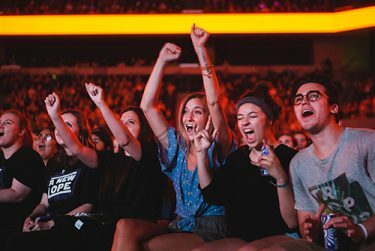 The Sith Lords and stormtroopers took over Grand Canyon University Arena on Thursday after chasing the one and only Caleb Duarte to the stage. 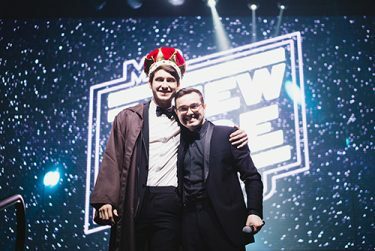 Fortunately for the emcee of the annual Mr. GCU talent show, the stormtroopers didn’t search too much for him and Duarte was tasked with one of the most important tasks one can have in this universe: finding the new Jedi Master/Mr. GCU. Students cheered and applauded their favorite Mr. GCU contestants. Duarte, who throughout the night was referred to by members of the dark side as rebel scum, along with the Canyon Activity Board brought out the inner nerd in everyone while giving one of sci-fi’s most successful franchises a GCU spin. Duarte considers the production quality the reason that made the 2019 Mr. GCU competition different from its predecessors. Eight potential Jedi took to the stage to showcase their lightsaber skills before their female escorts presented each candidate with his official Jedi robe. 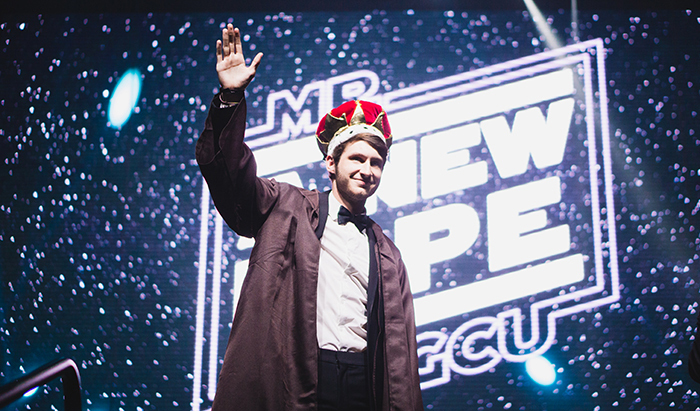 From there, each contestant was given his chance to convince the audience to vote for him. 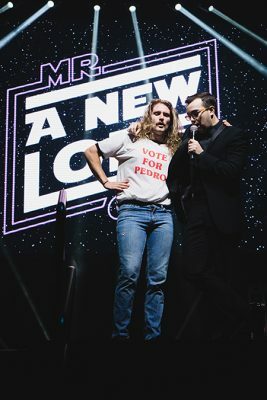 Christian Malott presented the audience with what he called “the holy trinity of movies” through a dance piece that showcased references from the films “Nacho Libre,” “Hot Rod” and “Napoleon Dynamite.” Students burst into laughter as Malott, took to the stage alone sporting the famous “Vote for Pedro” shirt and glasses. 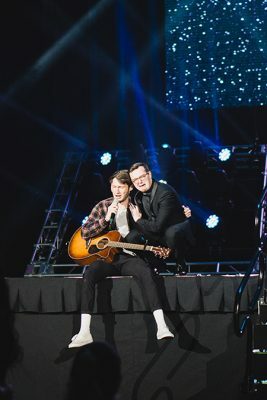 Putting a GCU twist on a more modern song, Daniel Hull shot confetti into the crowd while performing and dancing to his own rendition of Arianna Grande‘s ‘7 rings.’ When asked by Duarte how long he had worked on the song, Hull admitted to creating the parody track long before Mr. GCU. Taking a slower pace compared to the previous acts, Brock Frew turned the Arena into a wave of cellphone flashlights as he strummed his acoustic guitar and sang about the inspiration he found in sitting parked at a lake 80 miles from Santa Fe, N.M. If those words do not touch your soul, then you just weren’t there to experience Frew’s message of finding hope in dark times. 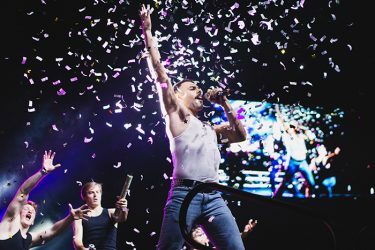 In light of the mainstream resurgence of British rock band Queen, Tyler Thornton used his likeness to Freddie Mercury to his advantage while dancing to a compilation of some of the band’s most recognizable tracks. Thornton’s performance involved throwing glitter confetti into the audience and invoking gasps from the audience as he pretended to shave his beloved mustache. Tyler Thornton was a very convincing Freddie Mercury in his performance of classic Queen hits. Closing out the talent performances of the night Jordan Brillantes put his hip-hop talents on full display. Brillantes used his computer and instruments to recreate beats to classics such as Miley Cyrus‘ “Party in the U.S.A.” and Kendrick Lamar‘s ‘Humble’ before inviting his fellow hip-hop club members to the stage to dance with him. The decision was tough, but ultimately viewers narrowed the contestants down to the final three: McGill, Frew and Brillantes. Duarte asked some tough questions, and after three rounds students were left with the hardest decision of all: selecting their new Mr. GCU. Brock Frew (left) was crowned Mr. GCU. Duarte invited former Mr. GCU Daniel Williams to the stage to help crown the winner, and Williams also thought it was a tough choice. “Every guy that I know that’s in this one, they’re all selfless people that are very involved in school and trying to help other people,” Williams said. “I feel, one, I’m kind of shaken, two, I’m really tired.” Frew said after being crowned. “We’ve done a lot of rehearsals, a lot of late nights, but honestly it’s just a blessing, I’m very humbled. Frew admitted that his title-winning talent almost didn’t make the cut, since he thought “it would either go really good or really horribly” but decided to take the chance. After the crowning of their new Jedi Master, Lopes could rest easy, for the galaxy was at last at peace.